When is a job not a job? | Damian Trasler's Secret Blog - Do Not Read! ← All the things I plan to do. I found this note in my pigeonhole at work yesterday. I mentioned in my last post that I enjoy talking to library patrons about the choices they have made in reading material or movies. A few weeks ago, a lady was borrowing a documentary I had seen a trailer for : Tim’s Vermeer. There were a number of reasons I was interested in this documentary. Firstly, the very first screenplay I wrote was about a Vermeer painting – “The Lacemaker“. It was a complex plot involving Salvador Dali, the Louvre, art fraud and a rhinoceros. The script is still available for development. Secondly, the documentary is made by Penn and Teller, whom I admire for their magical skills and their zeal in uncovering fraudsters of the allegedly psychic variety. Finally, it’s just an interesting concept. The subject – Tim Jenison – decided that Vermeer couldn’t possibly have managed to paint the variations of colour and texture the picture (he uses “The Music Lesson“) shows. There must, says Tim, have been some kind of device to allow Vermeer to see those variations as a camera sees them, not as an eye. While keen to see the documentary, I hadn’t been able to get hold of a copy, and mentioned this to the lady, asking if she would let me know what she thought of it. She said she would, and took my name, remarking that it’s rare to be served by the same person twice at the library, since shifts change so often. 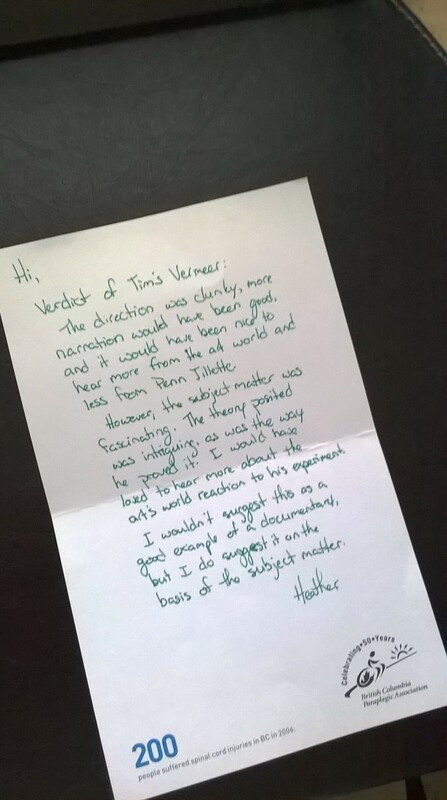 I was incredibly touched to return from my short break to find the handwritten review of the documentary shown above. That’s a great example of the OTHER kind of “Customer Service”. The direction was clunky, more narration would have been good, and it would have been nice to hear more from the art world and less from Penn Jillette. However, the subject matter was fascinating. The theory posited was intriguing, as was the way he proved it. I would have loved to hear more about the art world’s reaction to his experiment. This entry was posted in Uncategorized and tagged Books, Customer Service, documentaires, documentary, Library, patrons, Penn and Teller, Tim's Vermeer. Bookmark the permalink.